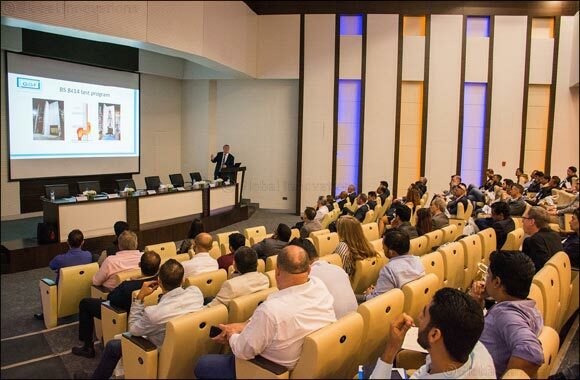 Dubai, UAE, 18 March 2019: Emirates Glass, a subsidiary of Dubai Investments PJSC and one of the largest processors of flat architectural glass in the Middle East, hosted the annual International Architectural Glass Conference at Dubai Investments House, an open forum of dialogue and discussion that gave glass professionals insight into a number of important industry topics including lessons from the Grenfell Tower fire tragedy, security glazing, and acoustic glazing. The all-day event, held in cooperation with the Glass and Glazing Federation MENA region (GGF), brought together industry experts and speakers from a range of international firms from the US, UK, Europe and the region, to present to over 130 delegates on a broad range of subjects. One session focused on the causes and lessons learned from the Grenfell Tower fire, a 2017 tragedy that took the lives of over 70 lives in a London towerblock. Others ranged from the performance of laminated glass, sealant compatibility, adhesive backed polymeric film design and anisotropy. Other topics covered during the event included safety and security glazing in the region, the increased use of laminated glass in the MENA region, the effects of acoustic pollution, new developments in silicone sealant glazing design and on anisotropy of heat-treated glass, and the benefit to energy sustainability presented by retrofit films.